PanARMENIAN.Net - While winter has been kinder to Armenians so far than it was in the previous several years, some corners of the country do enjoy the privilege of snow-capped mountains and pleasant wintery weather. Those visiting Armenia in cold season mainly flock to Tsaghkadzor, a resort town in the country’s Kotayk province which has a lot to offer from skiing to snowboarding to snowmobiling, tubing to sledding, culture, entertainment and more. Jermuk, on the other hand, is known for the mineral water of the same name as well as the Jermuk waterfall, with medieval cave complexes lying just outside the town. Located at an altitude of 2100 meters in a picturesque spot, the town boasts alpine meadows and mountain forests, rocky cliffs and waterfalls, as well as a host of mineral springs with different thermal temperatures from 20 to 65 degrees Celsius. A popular destination for medical tourism in the Soviet Union, Jermuk is still emerging as a winter entertainment resort and will hopefully offer more diversity in the years to come. Speaking of diversity, Jermuk’s snow art festival has been held almost every year since 2006, attracting a lot of tourists and Armenians who seek to expand their leisure options. 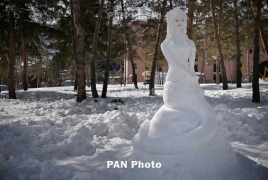 In a conversation with PanARMENIAN.Net director of the Youth Center of Jermuk CNCO Syuzanna Avetisyan detailed the process of building the snow sculptures, revealing that professionals will work alongside amateurs who will learn on the fly the snow art techniques with help and instructions from volunteers. All those wishing to participate will form groups of two and will be provided will all the necessary tools to create unique sculptures in full view of spectators. The main event is slated for February 17, with several musical and sports events scheduled for the next day. A slacklining event, in particular, is what usually draws a lot of attention. Syuzanna said it usually starts with performances from a professional slackliner after which those attending the festival are welcome to walk the slackline themselves. Furthermore, the Amateur Cycling Federation is traditionally holding the provincial winter cup in Jermuk during those days. To keep the guests maximally involved in the festival, the organizers are currently working to arrange non-traditional sports games. The details are still under wraps though for a surprise effect. Snowman festival is organized by the Youth Center of Jermuk CNCO, the Jermuk Development Center, with the town’s community council serving as its general partner.